It's been a fairly good week of melting. I only had one I didn't like in the bunch. I am running into a bit of problem! I'm running out of new wax to melt. 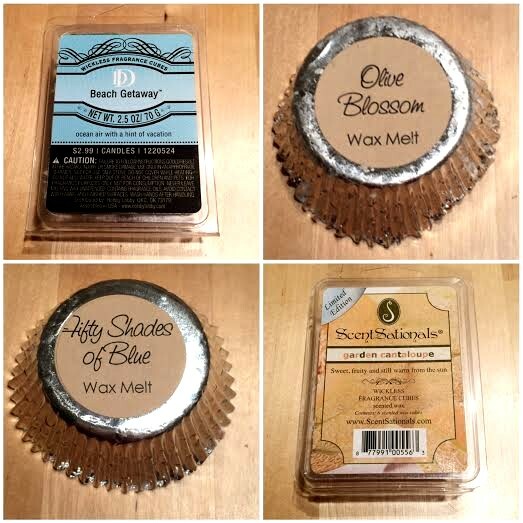 I've melted through all most all my new wax and only have waxes I've reviewed. I'm hoping my Walmart gets in the new ScentSationals spring line up soon! My Thoughts: I'm not sure what a "hint of vacation" smells like exactly, but I'm on board with this one. This smells similar to me to Yankee Candle's Sun & Sand. It has a strong salty ocean water note blended with that sandy beachy note. I like it. This is definitely one of those scents that I think is universally pleasing. You can't go wrong. It's fresh and beachy. It's not a stunner or a one-of-kind type scent, but definitely good solid scent. This has a good throw and lasted several hours when melted. My Thoughts: If you like rich and complex perfume-like scents, Olive Blossom is for you. I like those types of scents so I love this one. It's so hard to describe because I don't pick up on individual notes in this, it's just an overall elegant and rich floral perfume-like scent. This one is strong and had a great throw. My Thoughts: This is supposed to be a dupe to Lush's Olive Branch, which I've never smelled so I can't compare. What I will say is this one gets raved about a lot, but I really hated it. I don't get any bergamot, mandarin, lemon, or orange from this. This to me smells like powdery overly frilly grandma perfume mixed with cotton candy. It's sickly sweet, powdery, and just yuck. It's also strong, which didn't help matters for me. This scent is popular, so maybe it's just my nose? Do.not.like. Scent Description: Cantaloupe straight from the garden bursts with the fragrance of sweet, sugary melons freshly cut and ready to eat. My Thoughts: This is straight up pure cantaloupe. I love melon scents. They're the perfect blend of fresh, sweet, and watery notes. This is perfect. It doesn't smell artificial nor is it overly sweet. It's refreshing and makes me want to eat some cantaloupe! This is a winner! This has a great throw.